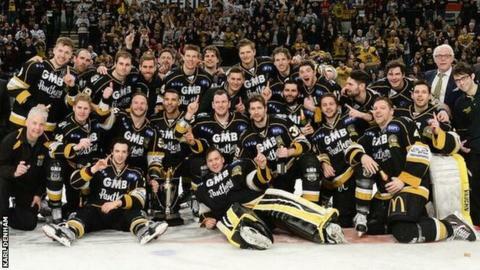 Nottingham Panthers saw off defending champions Cardiff Devils in overtime to lift the Challenge Cup for the sixth time in seven years in Sheffield. Evan Mosey scored the winner with four minutes, 25 seconds of overtime left, two days after the Panthers had beaten the Welsh side 6-1 in the Elite League. The victory keeps alive Corey Neilson's fourth-placed Panthers side's hopes of a league-and-cup double this season. It was a fourth consecutive defeat in all competitions for Cardiff. The Panthers had the best chance in a cagey first 20 minutes when Robert Lachowicz hit the side-netting with the Devils on a powerplay midway through the period. Cardiff, who beat Sheffield Steelers 2-1 in last year's final, improved in the second period with player-coach Andrew Lord shooting narrowly wide. The Welsh side, second in the Elite League behind leaders Sheffield, applied plenty of pressure in the final period of regulation time, but could not find the breakthrough. The Panthers came agonisingly close to finding a sudden-death winner with Stephen Schultz and Brad Moran both striking the woodwork, while Devils' Ben Bowns made a string of fine saves. But Cardiff's netminder could do nothing to stop Mosey's powerful, long-distance strike into the top corner, as the game threatened to go to penalty shots. The Devils had beaten Belfast Giants 8-4 on aggregate in the last four while hosts Nottingham saw off Sheffield Steelers to reach the final. Nottingham now travel to Coventry Blaze in the league on Wednesday, 9 March. Cardiff's next game is against Belfast Giants in the Elite League on Saturday, 12 March - the Devils' first match at their new home, the Ice Arena Wales.